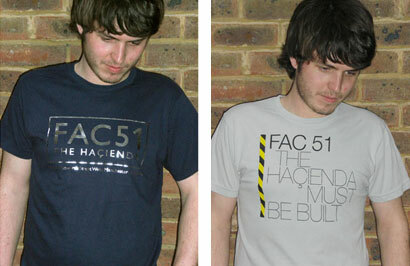 The Hacienda is long gone (replaced by an ugly block of flats bearing the same name), but nostalgia for the club grows by the year – with these officially licensed fac 51 Hacienda t-shirts likely to find a substantial market. Not just official licensed either, officially worn too – New Order’s Peter Hook had one on his back during the recent Manchester vs Cancer charity gig. 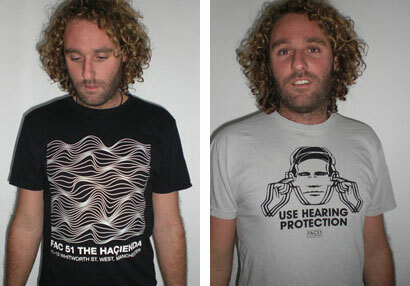 Four designs initially available (see over the turn for the other two), all with familiar Peter Saville artwork, all limited edition (once they’re gone, they’re gone) and printed onto 100 per cent cotton shirts. You can pick them up online via the site below, selling for £29.99 each.